So you've signed up for Zwinky and want to make a neat outfit. Don't know what to wear or how to put something on? Well, here's some news for you! Boys do not have makeup or dresses in their appearance and wardrobe menu. Choose what you want to be. If this is your first time, it should usually say "My First Outfit". Click on what you want to be- a female Cutie, a male Cutie, a female Hottie, or a male Hottie. Go to your drop-down menu. You can put on makeup and hair or your clothes first. Pick your favorite. If you're doing hair and makeup, go to the dropdown menu called "appearance". Choose Hair, Skin Color, Face, Makeup, Emotions, Scenes, or Symbols. For hair- pick a hairstyle and a hair color. 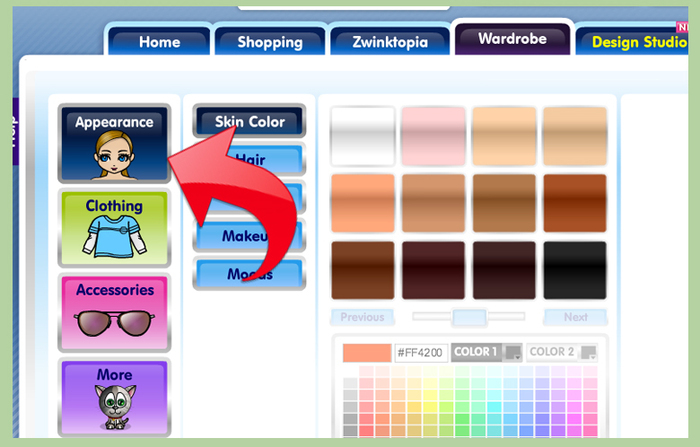 For skin color-pick your skin color out of the varieties they have, or make your own using the color picker. For face- Zwinky has a number of faces for you to choose from. Pick one and its eye color. Now for makeup: it says Lips,Blush,Eyeshadow, Eyeliner, and Mascara. Click on lips and pick a lip color. Do the same for everything else, too. 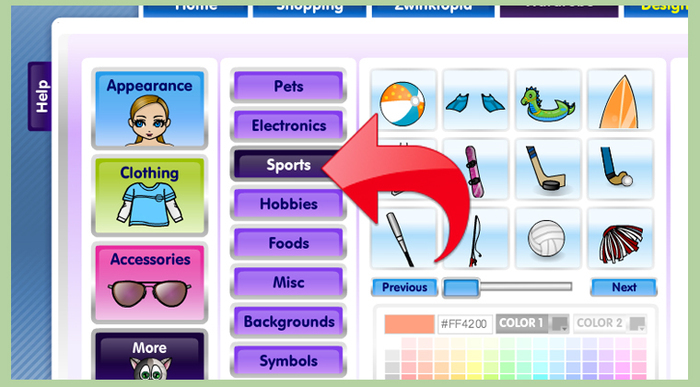 Go to Scenes on your dropdown menu for Appearance. If you see one you like, choose it and it'll provide a background for your avatar. Now go to Symbols. Pick a symbol. Pick a shirt and a color. Do the same for dresses and jackets, too. 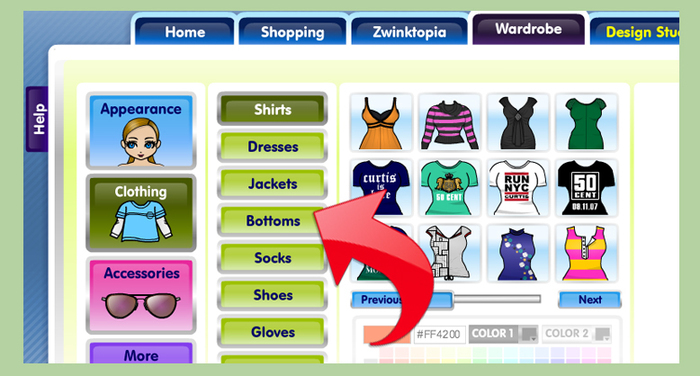 Hit your wardrobe menu and click Bottoms. There, you have a variety of pants and skirts (except on boys but the male Cutie) to choose from. Pick one and its color. 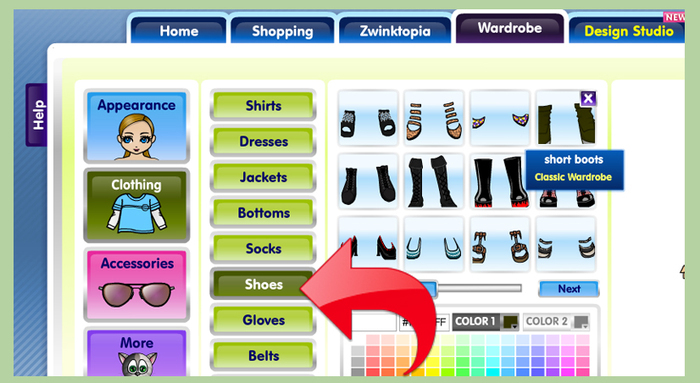 If you want tights or something, girls, move your mouse to the wardrobe menu and go to Bottoms. Then, it'll say Bottoms or Hosiery. Click on Hosiery. Now, there's a range of tights, leggings, and socks to wear. Click one and pick a color. Go to Shoes on your Wardrobe menu. Pick a good pair that suits your outfit, and a good color. 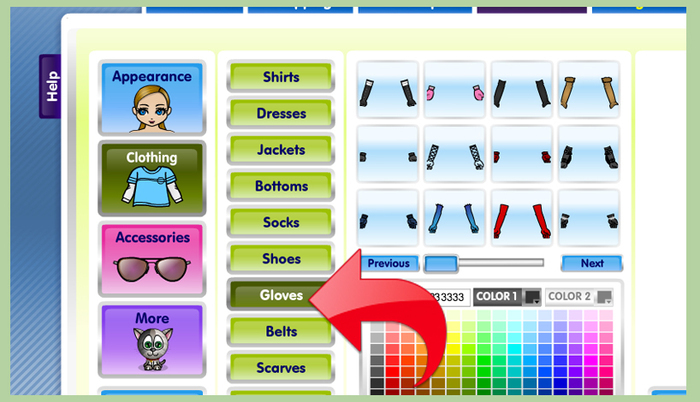 If you want gloves, a belt, or a scarf, go to Accessories and choose something stylish. Go and choose Jewelry. Pick a necklace, bracelet, ring, earring, or toe ring. Done with that? If you want glasses, click on Glasses. 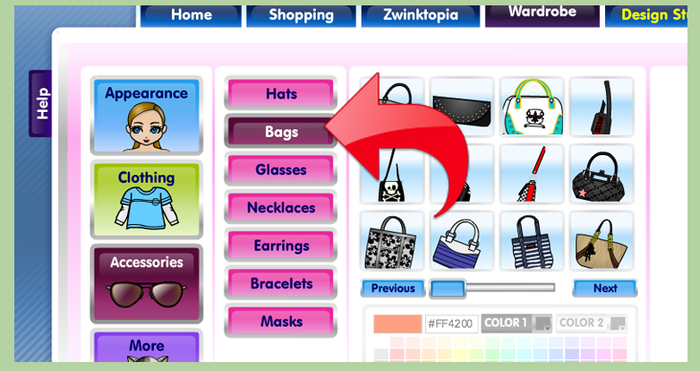 To choose a purse click on Bags. 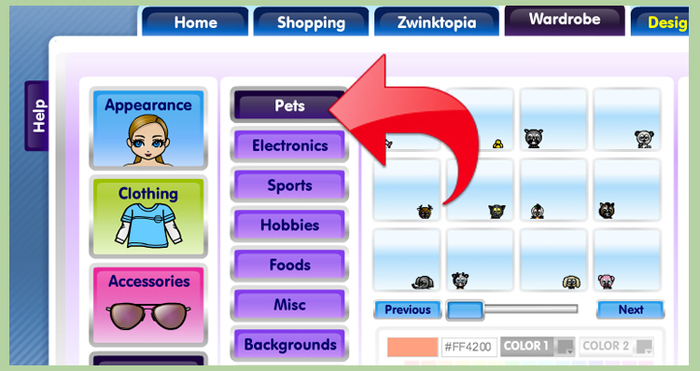 To find a pet click on Pets and get a furry friend. To choose an interest go to Interests. There's sports, hobbies, food, and electronics. Pick something that you like. 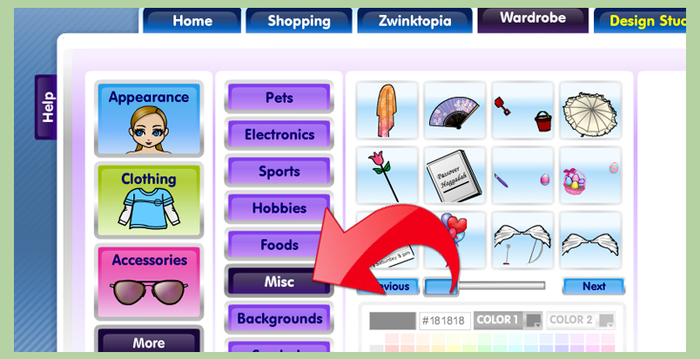 If you want something awesome to go with your outfit click Miscellaneous. There's some pretty cool stuff there. You are finished! 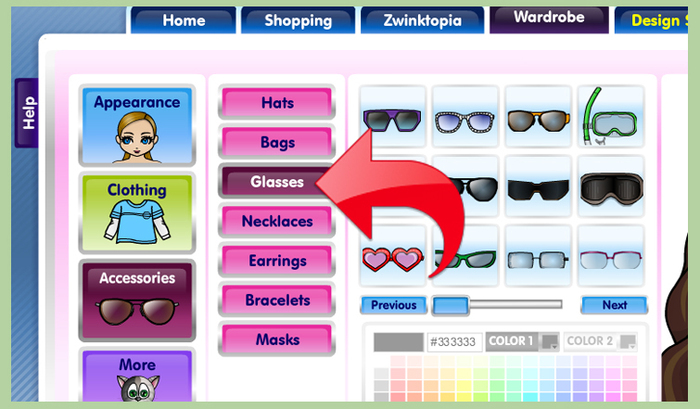 Click Save and head on out into Zwinktopia for shopping, gaming, and chatting with your buddies! When you are looking for something to buy and you click on an item that says you can only buy it with a Zcard, you can't buy it. 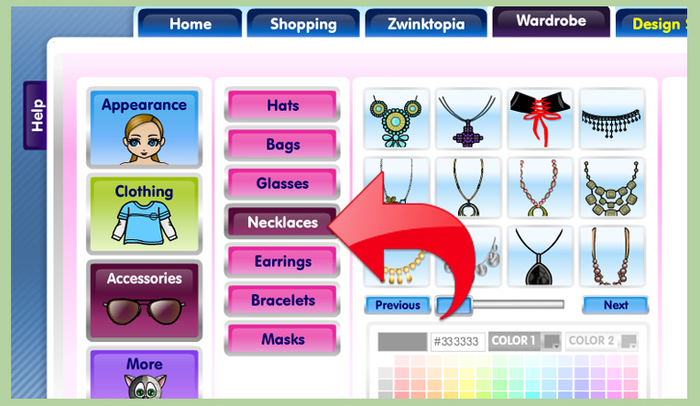 Those items can only be bought using your Zcard, which is an online credit card that you pay for. Half the stuff is locked when you first start out, so you are sadly limited on what to wear. In order to unlock your things, you have to earn 2,000 Zchievements. DO NOT HIT "SURPRISE ME" WHEN YOU DRESS YOUR ZWINKY! 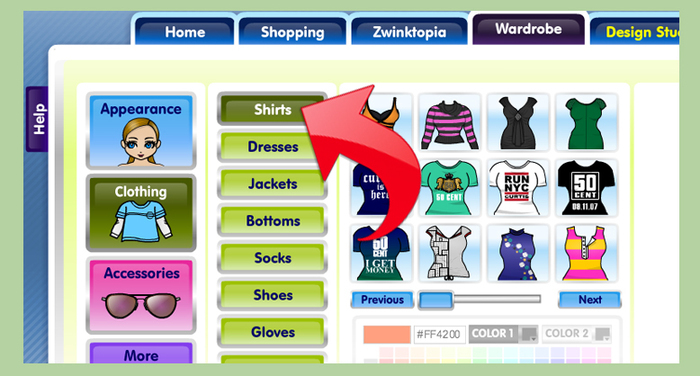 That button will totally randomize your outfit, like giving you crazy hair and clothes with wacky colors.